Download "An integrated investment approach"
4 04 Open architecture. Endless possibilities. At National Bank Investments, we are driven by the values that define us and set us apart: agility, convenience and reliability. 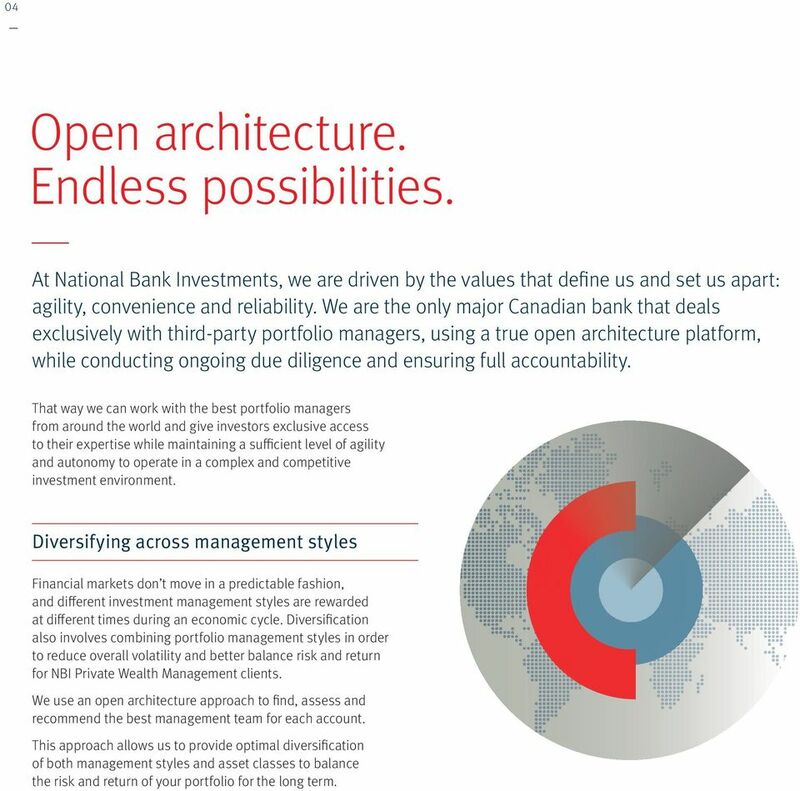 We are the only major Canadian bank that deals exclusively with third-party portfolio managers, using a true open architecture platform, while conducting ongoing due diligence and ensuring full accountability. That way we can work with the best portfolio managers from around the world and give investors exclusive access to their expertise while maintaining a sufficient level of agility and autonomy to operate in a complex and competitive investment environment. Diversifying across management styles Financial markets don t move in a predictable fashion, and different investment management styles are rewarded at different times during an economic cycle. Diversification also involves combining portfolio management styles in order to reduce overall volatility and better balance risk and return for NBI Private Wealth Management clients. We use an open architecture approach to find, assess and recommend the best management team for each account. This approach allows us to provide optimal diversification of both management styles and asset classes to balance the risk and return of your portfolio for the long term. 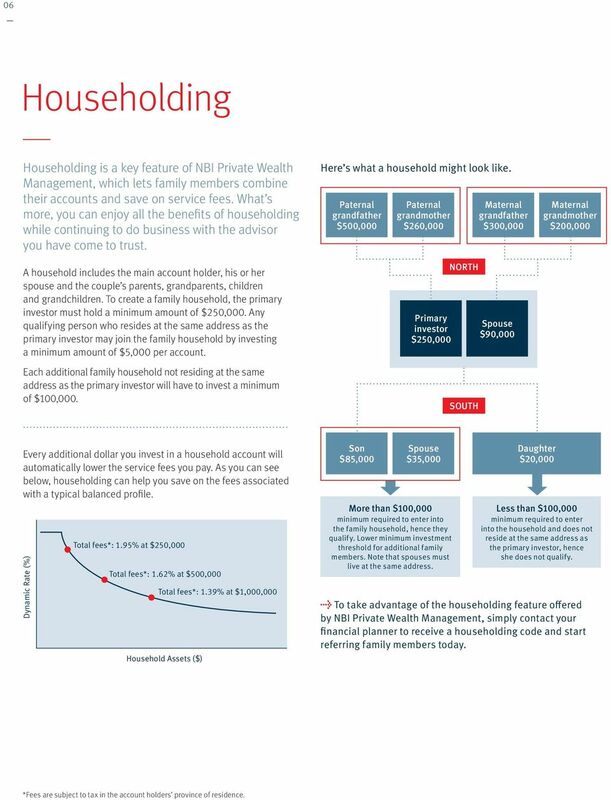 6 06 Householding Householding is a key feature of NBI Private Wealth Management, which lets family members combine their accounts and save on service fees. What s more, you can enjoy all the benefits of householding while continuing to do business with the advisor you have come to trust. A household includes the main account holder, his or her spouse and the couple s parents, grandparents, children and grandchildren. To create a family household, the primary investor must hold a minimum amount of $250,000. Any qualifying person who resides at the same address as the primary investor may join the family household by investing a minimum amount of $5,000 per account. Each additional family household not residing at the same address as the primary investor will have to invest a minimum of $100,000. Here s what a household might look like. Paternal grandfather $500,000 Paternal grandmother $260,000 Primary investor $250,000 NORTH SOUTH Maternal grandfather $300,000 Spouse $90,000 Maternal grandmother $200,000 Every additional dollar you invest in a household account will automatically lower the service fees you pay. As you can see below, householding can help you save on the fees associated with a typical balanced profile. 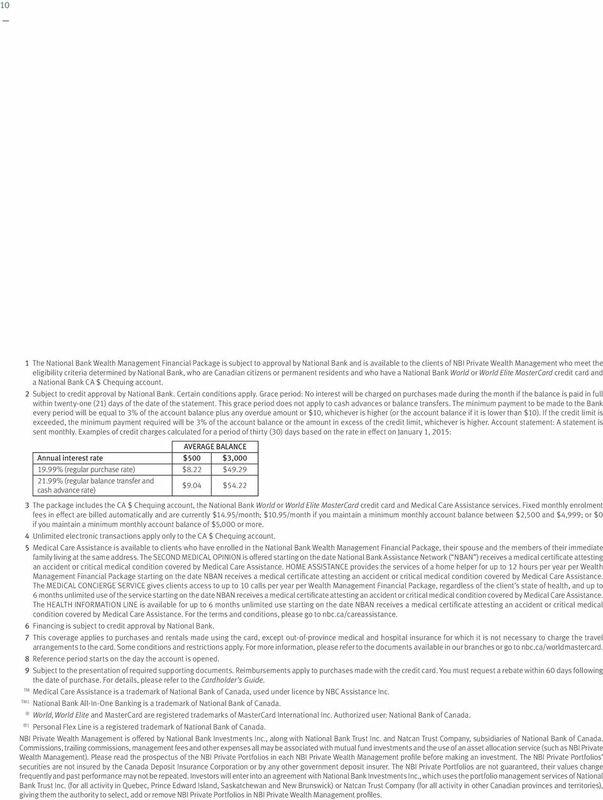 Dynamic Rate (%) Total fees*: 1.95% at $250,000 Total fees*: 1.62% at $500,000 Total fees*: 1.39% at $1,000,000 Household Assets ($) Son $85,000 Spouse $35,000 More than $100,000 minimum required to enter into the family household, hence they qualify. 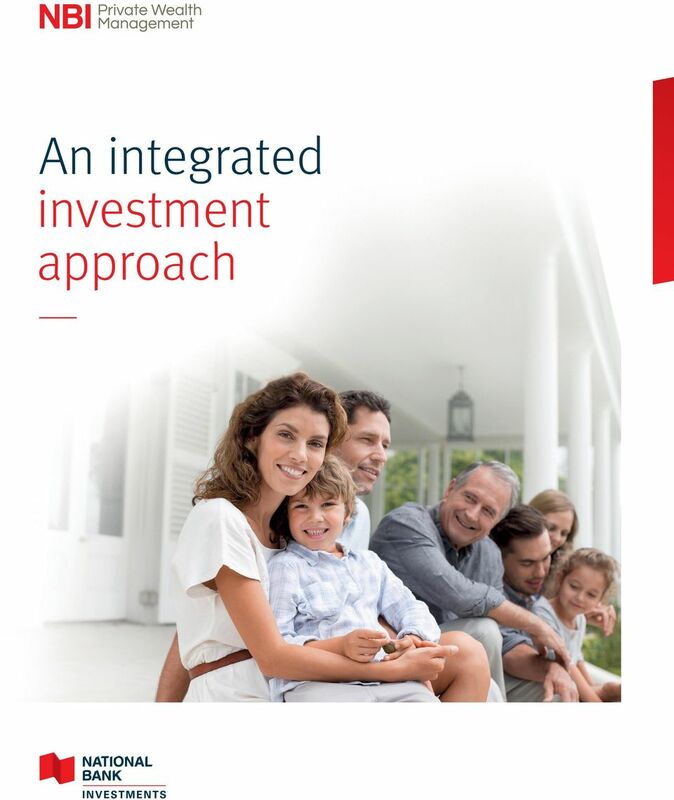 Lower minimum investment threshold for additional family members. Note that spouses must live at the same address. Daughter $20,000 Less than $100,000 minimum required to enter into the household and does not reside at the same address as the primary investor, hence she does not qualify. l To take advantage of the householding feature offered by NBI Private Wealth Management, simply contact your financial planner to receive a householding code and start referring family members today. *Fees are subject to tax in the account holders province of residence. 7 07 Wealth Management Financial Package Enjoy a world of exclusive benefits Your Financial Package 1 Make our CA $ Chequing account and the National Bank World Elite MasterCard, 2 credit card your main banking tools and get privileged access to a world of personalized services and exclusive advantages for $ a month or without any fixed monthly enrolment fee if a minimum monthly balance of $5,000 is maintained. To benefit from the financial package, you must hold at least $100,000 in assets under NBI Private Wealth Management. The spouse of the primary investor may join with a minimum amount of $5,000 in assets held. The offer comes with many advantages: Two bank accounts: One in CA $ One in US $ 4 The National Bank World Elite MasterCard credit card A rewards program with accelerated accumulation tiers: Net purchase volume over 12 months From $0 to $40,000 From $40,001 to $80,000 $80,001 and more 1.5 points for each dollar in purchases 2 points for each dollar in purchases 1.5 points for each dollar in purchases point for each dollar in purchases made in a foreign currency A premium travel insurance program 7 : Out-of-province-of-residence medical/hospital care Flight cancellation Trip interruption Delayed flight Loss of baggage Car rental Smart traveller fee reimbursements, up to $250 per account for each 12-month 8 period: Up to $100 for airport parking fees Up to $100 for luggage charges Up to $50 for seat selection fees 9 The Medical Care Assistance TM program 5 : Second medical opinion Home assistance Medical concierge service Dedicated health information line A concierge travel service available 24/7, both in Canada and abroad: Trip reservations Information Travel assistance Ticket reservations for sporting events Preparation of gift baskets, etc. Plus, get attractive rates on the following financing solutions: Personal Flex Line 1, 6 National Bank All-In-One Banking TM1, 6 Mortgage loan 6 Your spouse can benefit from the program s advantages without having to be an authorized user of the World Elite MasterCard credit card. Speak to your planner to learn more about the conditions that apply to spouses. l Alternatively, the National Bank World MasterCard credit card is available as part of the financial package. For more details, visit nbc.ca/world. l To take advantage of the Wealth Management Financial Package, please contact your financial planner. 8 08 Ongoing financial information We want to make sure you are well informed. Among other things, you will receive: detailed periodic statements that include your personal rate of return; a quarterly newsletter, which discusses recent market developments, shares our investment managers current outlook and contains a detailed account of the returns of model portfolios in relation to market indexes, as well as the asset class mix; semi-annual and annual reports detailing all the series in NBI Private Portfolios; financial commentaries reviewing market events and highlighting the proactive approach used in managing your portfolio; convenient and secure online access to your portfolio summary at all times. 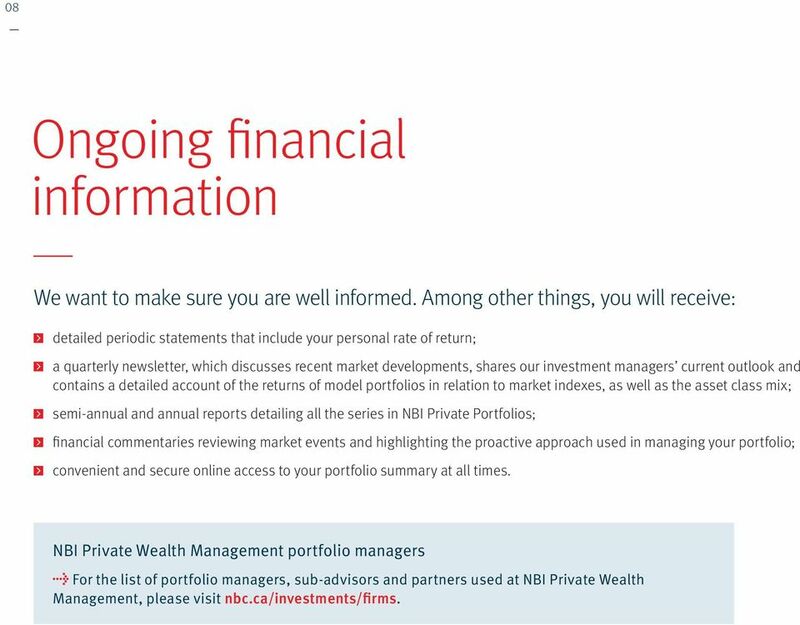 NBI Private Wealth Management portfolio managers l For the list of portfolio managers, sub-advisors and partners used at NBI Private Wealth Management, please visit nbc.ca/investments/firms. 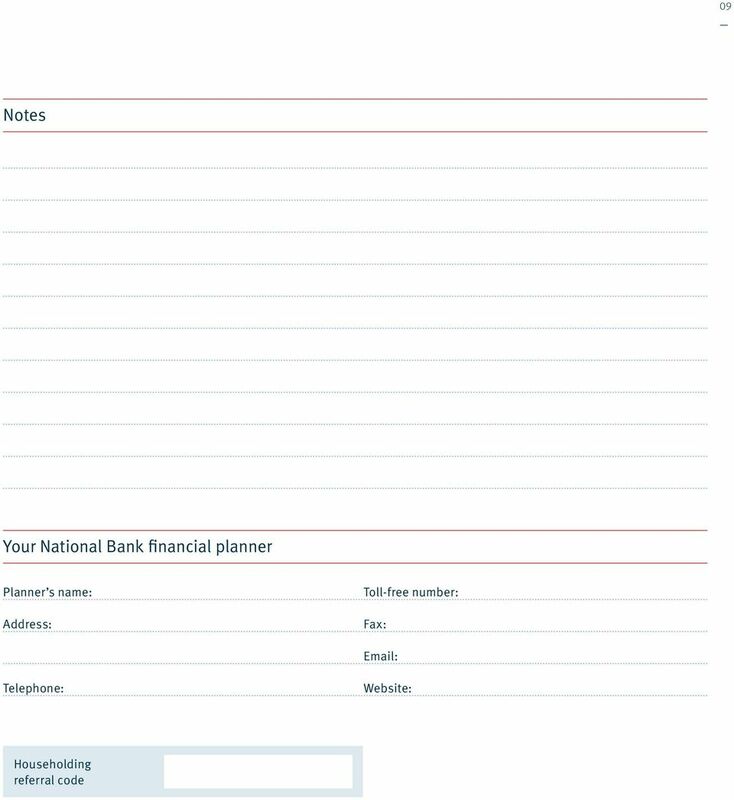 10 10 1 The National Bank Wealth Management Financial Package is subject to approval by National Bank and is available to the clients of NBI Private Wealth Management who meet the eligibility criteria determined by National Bank, who are Canadian citizens or permanent residents and who have a National Bank World or World Elite MasterCard credit card and a National Bank CA $ Chequing account. 2 Subject to credit approval by National Bank. Certain conditions apply. Grace period: No interest will be charged on purchases made during the month if the balance is paid in full within twenty-one (21) days of the date of the statement. This grace period does not apply to cash advances or balance transfers. The minimum payment to be made to the Bank every period will be equal to 3% of the account balance plus any overdue amount or $10, whichever is higher (or the account balance if it is lower than $10). If the credit limit is exceeded, the minimum payment required will be 3% of the account balance or the amount in excess of the credit limit, whichever is higher. Account statement: A statement is sent monthly. Examples of credit charges calculated for a period of thirty (30) days based on the rate in effect on January 1, 2015: AVERAGE BALANCE Annual interest rate $500 $3, % (regular purchase rate) $8.22 $ % (regular balance transfer and $9.04 $54.22 cash advance rate) 3 The package includes the CA $ Chequing account, the National Bank World or World Elite MasterCard credit card and Medical Care Assistance services. Fixed monthly enrolment fees in effect are billed automatically and are currently $14.95/month; $10.95/month if you maintain a minimum monthly account balance between $2,500 and $4,999; or $0 if you maintain a minimum monthly account balance of $5,000 or more. 4 Unlimited electronic transactions apply only to the CA $ Chequing account. 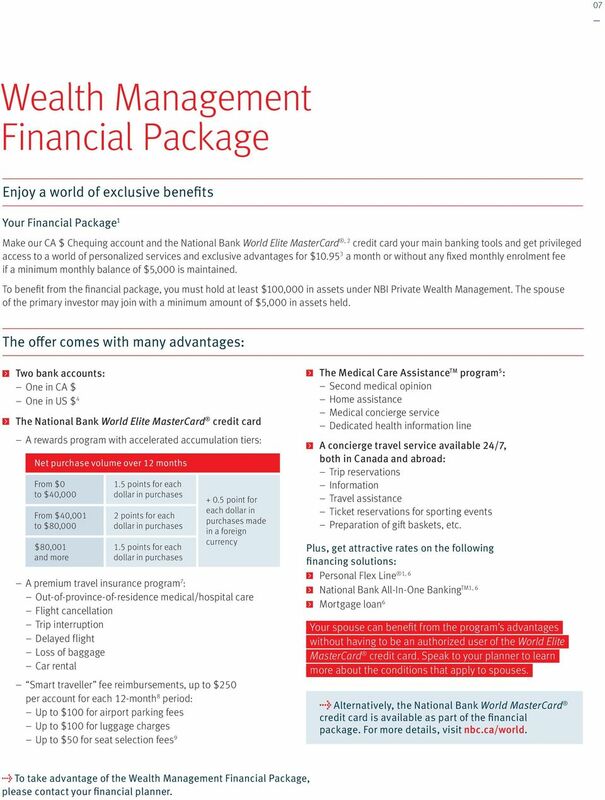 5 Medical Care Assistance is available to clients who have enrolled in the National Bank Wealth Management Financial Package, their spouse and the members of their immediate family living at the same address. The SECOND MEDICAL OPINION is offered starting on the date National Bank Assistance Network ( NBAN ) receives a medical certificate attesting an accident or critical medical condition covered by Medical Care Assistance. HOME ASSISTANCE provides the services of a home helper for up to 12 hours per year per Wealth Management Financial Package starting on the date NBAN receives a medical certificate attesting an accident or critical medical condition covered by Medical Care Assistance. The MEDICAL CONCIERGE SERVICE gives clients access to up to 10 calls per year per Wealth Management Financial Package, regardless of the client s state of health, and up to 6 months unlimited use of the service starting on the date NBAN receives a medical certificate attesting an accident or critical medical condition covered by Medical Care Assistance. The HEALTH INFORMATION LINE is available for up to 6 months unlimited use starting on the date NBAN receives a medical certificate attesting an accident or critical medical condition covered by Medical Care Assistance. For the terms and conditions, please go to nbc.ca/careassistance. 6 Financing is subject to credit approval by National Bank. 7 This coverage applies to purchases and rentals made using the card, except out-of-province medical and hospital insurance for which it is not necessary to charge the travel arrangements to the card. Some conditions and restrictions apply. For more information, please refer to the documents available in our branches or go to nbc.ca/worldmastercard. 8 Reference period starts on the day the account is opened. 9 Subject to the presentation of required supporting documents. Reimbursements apply to purchases made with the credit card. You must request a rebate within 60 days following the date of purchase. For details, please refer to the Cardholder s Guide.  TM Medical Care Assistance is a trademark of National Bank of Canada, used under licence by NBC Assistance Inc. TM1 National Bank All-In-One Banking is a trademark of National Bank of Canada. World, World Elite and MasterCard are registered trademarks of MasterCard International Inc. Authorized user: National Bank of Canada. 1 Personal Flex Line is a registered trademark of National Bank of Canada. NBI Private Wealth Management is offered by National Bank Investments Inc., along with National Bank Trust Inc. and Natcan Trust Company, subsidiaries of National Bank of Canada. Commissions, trailing commissions, management fees and other expenses all may be associated with mutual fund investments and the use of an asset allocation service (such as NBI Private Wealth Management). 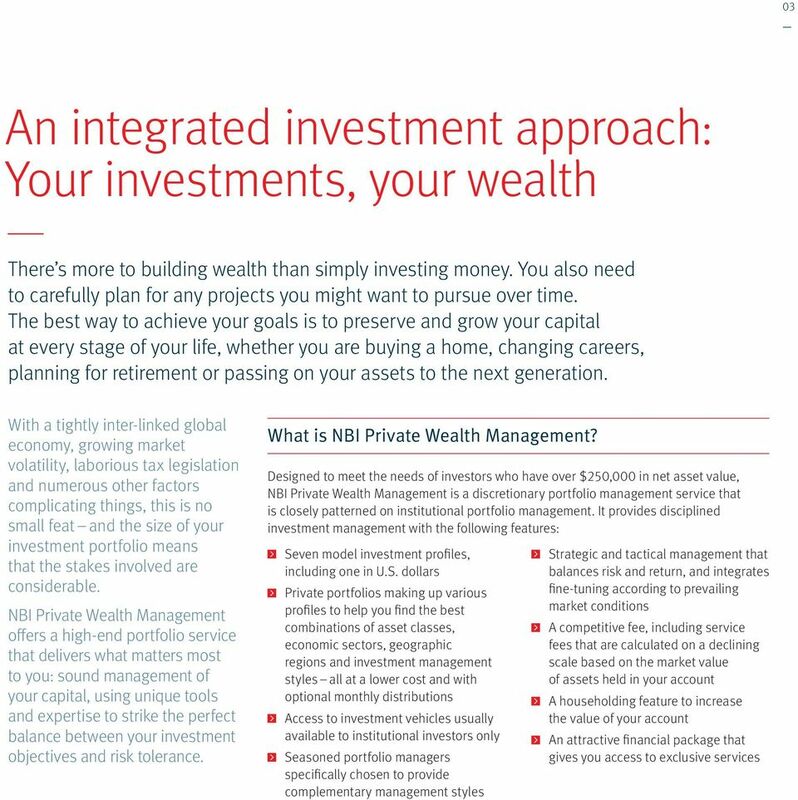 Please read the prospectus of the NBI Private Portfolios in each NBI Private Wealth Management profile before making an investment. The NBI Private Portfolios securities are not insured by the Canada Deposit Insurance Corporation or by any other government deposit insurer. The NBI Private Portfolios are not guaranteed, their values change frequently and past performance may not be repeated.  Investors will enter into an agreement with National Bank Investments Inc., which uses the portfolio management services of National Bank Trust Inc. (for all activity in Quebec, Prince Edward Island, Saskatchewan and New Brunswick) or Natcan Trust Company (for all activity in other Canadian provinces and territories), giving them the authority to select, add or remove NBI Private Portfolios in NBI Private Wealth Management profiles. 12 Simplifying your day-to-day banking transactions. Helping you carry out the projects that are important to you. Customizing solutions and advice for your short-term projects and retirement plans. Insuring you and your assets for your peace of mind. Making sure your estate is transferred to your loved ones. Helping decisionmakers grow their business. 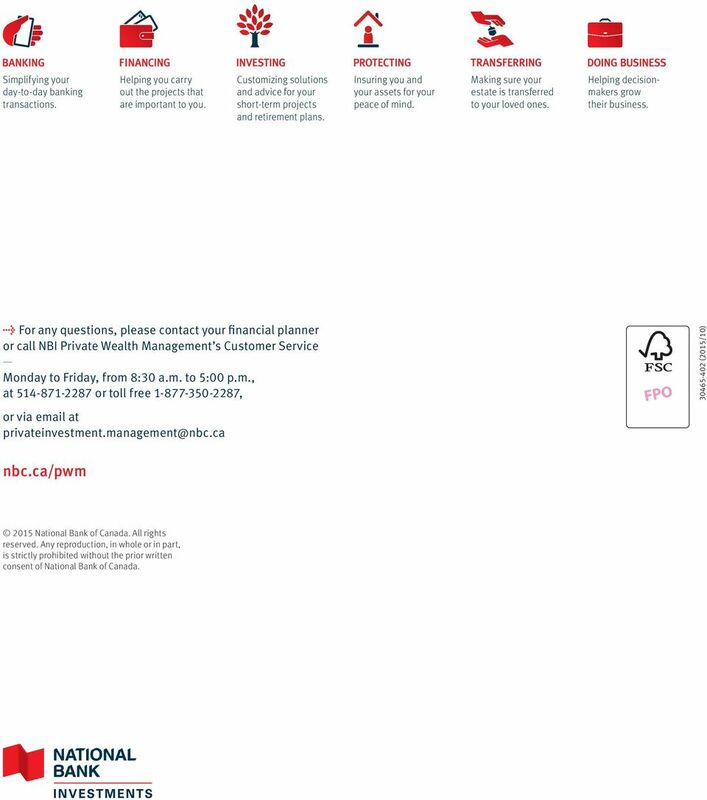 l For any questions, please contact your financial planner or call NBI Private Wealth Management s Customer Service Monday to Friday, from 8:30 a.m. to 5:00 p.m., at or toll free , (2015/10) or via at nbc.ca/pwm 2015 National Bank of Canada. All rights reserved. Any reproduction, in whole or in part, is strictly prohibited without the prior written consent of National Bank of Canada. Planning a trip? We have you covered, from travel insurance to managing your money. The Pinnacle Funds. Simplified Prospectus. December 11, 2009 Class A and Class F units and Class I units where noted. Money Market Fund. Asset Management Portfolio Solutions Disciplined Process. Customized Approach. Risk-Based Strategies. INSTITUTIONAL TRUST & CUSTODY Asset Management Portfolio Solutions Disciplined Process. Customized Approach. Risk-Based Strategies. 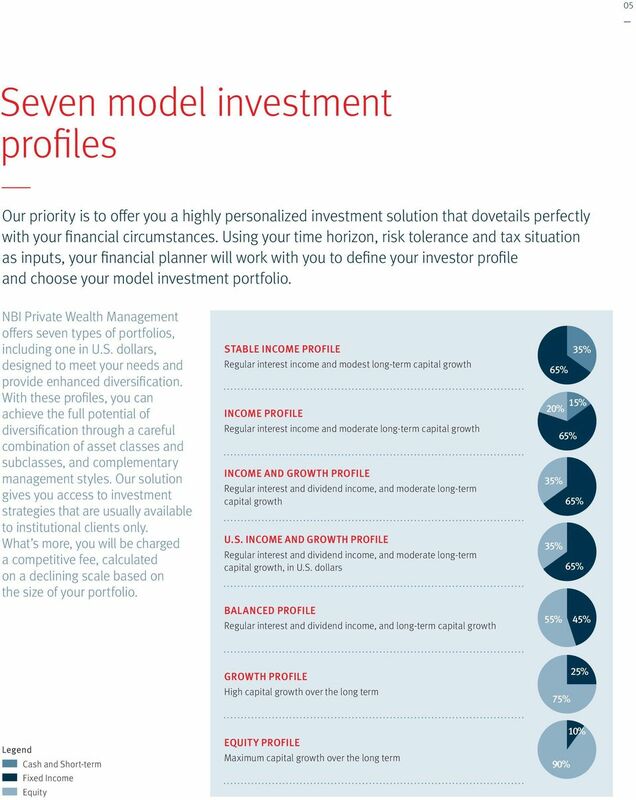 As one of the fastest growing investment managers in the nation, U.S.
smart S A V E M O N E Y A N D R E T I R E T O M O R R O W Two Paths to Investing for Retirement Which one is right for you? Please complete and sign this Application, along with any required supplemental forms identified through this application process.